Get Your Trucks Ready - Road Check is June 2-4! 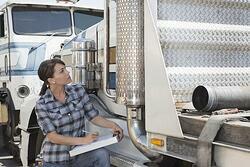 The Annual Road Check 72 hour inspection blitz on Commercial Vehicles is set to take place this year from June 2-4. The CVSA inspects an average of 17-18 Commercial Vehicles PER MINUTE during the 3 day period, so it's important to make sure you and your truck are prepared. The purpose of the annual blitz is to ensure the safety of the public traveling on highways, but it also serves to protect drivers themselves by reminding us to be vigilant checking on all possible safety issues on our vehicles and stick with best practices to ensure everyone is as safe as reasonably possible. The top categories for violations are: Brakes, Lights, Tires, and Cargo Securement. Make sure youre wearing your seatbelt! It sounds silly but this is actually the most commonly cited violation on inspection, and its the easiest one to correct. Make sure coupling devices are present in proper number and are in acceptable condition - no excessive wear, missing parts, or cracks. Make sure your cargo is secured properly! This is the 4th most common reason for being put out of service, and really should be something we are all on top of every day. The above points are critical for the annual inspection, but they're also things you should really be checking in your pre and post trip vehicle inspections daily as well. It takes very little time to give your truck a once over and make sure everything is as it should be, and the payoff for doing so is enormous. If you have any questions, feel free to contact us in the comments section. Good luck everyone! !